MAINZ, Germany — Police in Germany evacuated several buildings in six cities throughout Germany on Tuesday after bomb threats were emailed to city officials. Officials in Kaiserslautern, Chemnitz, Rendsburg, Augsburg, Göttingen and Neunkirchen received bomb threats to their general email inboxes, police in each told NBC News. In Göttingen, police searched the building but said they found no cause for concern. The streets around the area were then reopened around two hours later but the town hall remained closed for the day, police announced in a tweet. The threat in the southwestern city of Kaiserslautern led to the evacuation of a 21-story high rise where more than 1,000 people work. Police searched the building but found nothing. 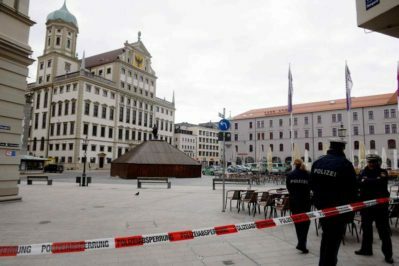 In Augsburg in southern Germany the town hall and a nearby administration building were both evacuated. In Neunkirchen, also in the southwest of Germany, police evacuated several buildings belonging to the town hall complex and sniffer dogs searched for explosive devices. An email was sent to the city’s general email inbox in the early hours of Tuesday morning saying that an explosive device had been planted at the town hall. “It is possible that the threat emails in the different German cities have been sent by one person, but the investigation is ongoing,” a police spokesman told NBC News. The multi-storey town hall building in the east German city of Chemnitz was also evacuated after a bomb threat was sent to the city’s general email inbox, police told NBC News. Police were searching the building. In the northern German city of Rendsburg the local town hall was also evacuated this morning after receiving an email, police said. Andy Eckardt reported from Mainz, Germany, Rachel Elbaum from London. Please read my Following Articles where i have clearly written the situations which would be most Venomous when Mars goes in the sign Taurus and from this sign it will aspect Saturnand Ketu by strong 8th aspect and give rise to the significations of Mars in a violent way. Lunation in the 7th house of Wars and the 7th Lord in Fallen, Retrograde mode in the 12th house of Espionage and Secret Plots is Prone to Multiple attacks by the Enemy from the 20th March to 5th April 2019, as indicated by the Lunation chart.The Lagna Lord Jupiter Placed in the 9th house in Gandantha aspected By Mars Degree-wise is afflicting is also causing a concern regarding Temples courts and Religion. The other person who would have produced the best and most brilliant book on mundane astrology was the Late Hardeo Sharma Trivedi who wrote a Book in Hindi ‘ Vypar Ratna’ which is a brilliant book on Financial Astrology. As per KN Rao he used vast Techniques and even he would have disclosed the secret of Karpoor Chakra. He showed often to Mr Rao and pinpointed the way and places in which there would be good or bad event as the planets moved from Rashi to Rashi. In this Connection I would like to Point out that I am using a similar Chakra not mentioned in any book which points out the event and direction absolutely parallel to what has been pointed out by Mr K N Rao and Found amazing Results . On the Basis of this Chakra I have made number of Predictions which have proved on dot. The Day Lord is also the Ascendant Lord and The Direction which it indicates is also East . The Sign Taurus is also aspected by Jupiter from the 9th house the sign Scorpio. India may put Pressure in the UN for declaring Mazoor as a Terrorist . Since the Moon is placed in the 7th house of International affairs,wars ,espionage from Secret Foreign Agents,Immorality in the nation , Foreign Trade and Relation.The Nation may be putting the energy in these affairs. Moon is Placed in the Yama of Scorpio where it debilitates and Jupiter the 10th and the Ascendant Lord is placed in Scorpio and Lord is placed in the 2nd house hence affairs of the 2nd house will also be under Screen related to Revenues and Banking Sector. Since the Lunation is taking place in the 7th house we also have to see the Placement of the 7th Lord who is placed in the 12th house of War Losses Espionage, secret Plots ,assassination, arson, loot, foreign spies where it is in Retrograde motion, also Fallen and in most malefic condition. This is indicative of some conspiracy and Espionage by Foreign elements in the Country . It shows crystal clear that China trying to influence the policy of the Country by helping Mazoor Azar and Pakistan. It is possible that China puts lot of Pressure on India. 7th Lord Mercury is also placed in the Yama of the Sign Gemini the 4th house of the Chart and the 10th house from the 7th house, this is indicative of the Enemy is in the Battle field for War with our Country . It is in Retrogression mode and hence multiple attempts may be made by the enemy specially when it changes the motion till 28th March and then after 28th March when it becomes direct and enters the Lagna where it debilitates on the 11th April 2019. The Planetary positions in this Forthnight are killing . This is also not good for the Stock and the Financial markets starting from the 10th April 2019 when Jupiter also goes in the Retrogression. The Conjunction of Saturn, Ketu and Jupiter after 29th March and the Jupiter and Saturn going in Retrogression from the 10th and 30th April 2019 will play with the Stock markets for a Long term Break. I will write another Article on the Global Economy although this Fortnight is most crucial for Stock and Financial Markets taking a hit. The Planets are in the visible half hence the activity will be seen soon just on the 21st March 2019 and there after . Weather Changes cannnot be ruled out. Saturn and Mars will be forming most Inauspicious yogas from the 22nd March to 8th August 2019. What they have up their Sleeves is what I am going to dicuss in this Article . There form Inauspicious Yogas when in 6/8 axis, when Samsaptak and in the present scenario Mars will be forming inauspicious yoga with the nodes also and then the Degree conjunction of Mars and Rahu opposed by Degree conjunction of Saturn anfd Ketu is a dreaded one and specially when they will also be in their own nakshatras in the 26th dec. 2019 Eclipse which will be discussed later. Mars the Red Planet has ingressed in the sign Aries the Ascendant of the Natural Zodiac on the 5th Feb. 2019 and then Aspects the Karka for wealth Jupiter placed in the 8th house of the Natural Zodiac by strong 8th aspect . Before the Ingress of Mars in Aries sign there was exchange of Mars and Jupiter , Mars as the Ascendant Lord and the 8th Lord and Jupiter as the 9th and the 12th Lord , the Exchange of the Trik Bhavas Lords of the Natural Zodiac now play the game when Mars becomes strong and aspects Jupiter as explained above. In My Previous Articles on the Stock and Financial Markets I had mentioned the following Parameters based on the Natural Zodiac of Aries sign For Global Predictions of Stock and Financial Markets . 3. When Ever these Nodes are in Venomous motion and exceptional motion the Nodes will turn most malefic and the Effects will be reverse of the happenings for Global events.10th House is heaven and controls the Major Happenings of the universe. 4. On the 5th Feb. 2019 Mars the Ascendant Lord has shifted in the Ascendant and aspects the 9th Lord placed in the 8th house , also the Dispsositor of Saturn in the 8th house will be aspected by the 8th Lord and the Lagna Lord hence the Rajyogas formed by Ketu in the 10th house will be weak and lose the shine. After the 23rd March 2019 Ketu will shift back in the sign Sagitarius and the Raj yogas formed by it in the 10th house earlier will be totally lost and will become most malefic for the World Events. 9. On the 25th April 2019 Saturn will be Stationary and will go in Retrogression on the 30th April 2019 will add fuel to the Fire at this Point Saturn will be in the nakshatra of Poorva Shada and also in Nakshata gandantha since at 26.24 degrees . This Point and Time may prove most malefic for the Opposition Parties, Stock and Financial Markets, Political Tug of War taking a ugly dimension, Natural and Unnatural calamities, Earthquakes vcannot be ruled out and all may be on the cards . All this will happen till 7th May 2019 with strong maleficiance . Hence A time frame from 10th March when Saturn will be 24 degrees and then from 22nd March to 7th May 2019 will be a period which could turn the tables for all of the above , may be it is Politics, Financial Markets EarthQuakes and untoward happenings . Now Have a Look at the Chart below of the 25th April 2019 Using the US Ascendant of Leo.Note the special Parameter Saturn is Stationary and truning Retrograde on the 30th April 2019 and 5 days before Saturn become Stationary. The above combination start from the 9th April to 26th April and can prove most Venomous it so seems. Not only for US but other Countries also where Mars will Transit in Taurus in the Ascendant, Kendra 4/10 axis 6th, 8th or the 12th house of the Foundation chart of the Country. The Countries Prone to this Transit will be US, India, Pakistan,Japan,China,Dubai,Indonesia,Iraq,Paris, Malasyia, North Korea so many Countries and there the Eclipses are also taking place and Sub Dasha of a Planet Like Rahu who has the capacity to bring a Down fall for the Country. US is Most Prone to this Combination. For India the Mars in the Lagna and the Saturn, Ketu and Jupiter in the 8th house seems to be most Venomous for the Country, since the Dasha of Moon-Jupiter is in operation and Jupiter is also the Lord of the 8th and the 11th house and in Transit it will be in most afflicted condition. ← Saturn Ketu Jupiter & Pluto On the Steering Wheel of Economy What They Have Up Their Sleeves For India ?